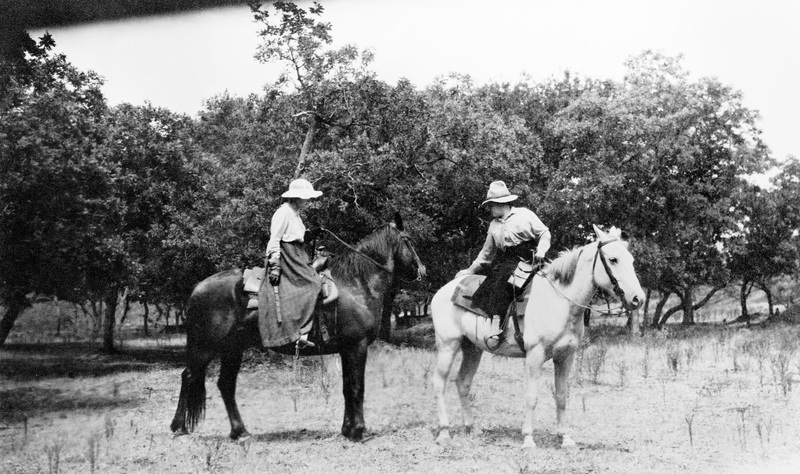 Western author Bertha M. Bower (left) rides side saddle along the Tongue River in 1917, accompanied by Nancy Russell’s sister, Jean Ironside. MHS Photo Archives 941-206. Following the publication of Owen Wister’s The Virginian in 1902, Western novels became extremely popular, and several Montana women became successful genre writers. These writers, including Caroline Lockhart and Bertha Muzzy Sinclair Cowan (best known as B. M. Bower), drew inspiration from the life, land, and folklore of Montana. Their stories suggest the enduring place that Montana has in the imagined, symbolic West. They also reveal the role gender discrimination played in popular expectations about Westerns and their creators. Scholar Jane Tompkins has explored the power of the Western—both in novels and on film—in the American psyche. She argues, “The West functions as a symbol of freedom, and of the opportunity for conquest. It seems to offer escape from the condition of life in modern industrial society. . . . [T]he creak of saddle leather and the sun beating down, the horses’ energy and force—these things promise a translation of the self into something purer and more authentic, more intense, more real.” This version of the West was decidedly masculine. And while largely mythic, it was an idea that was wildly popular—especially among the country’s young men—from 1900 to 1975. Montana’s women writers both capitalized on this western myth and modified it. Caroline Lockhart was often quoted as saying she was “born on a horse,” and her Westerns reflect her deep affection for both the West and the ranching way of life. Born in Illinois in 1871, Lockhart grew up in Kansas. Her father farmed and later traded cattle, so Lockhart had early experience with rural farm life. At eighteen she moved east to become the first female reporter for the Boston Globe. She later moved to Philadelphia to work for the Philadelphia Bulletin. In 1901 the paper sent her to Montana to write a story about the Blackfeet Indians. During the trip Lockhart fell in love with the West; in 1904 she moved to Cody, Wyoming, and launched her new career as a Western novelist. Caroline Lockhart’s first book was Me-Smith. Published in 1911, it became a national hit and was compared favorably with the writings of Owen Wister. One reviewer praised its realistic portrayal of western life: “[Me-Smith] is a photograph of the actual life of the West. You see and grasp the life of this country.” Her second novel, The Lady Doc, became even more popular nationally, though it drew significant criticism in Cody for its close resemblance to (and unsympathetic portrayal of) actual townspeople. The Lady Doc cemented Lockhart’s reputation as a novelist who excelled at creating strong characters in a “realistic”—at least in the minds of Easterners—western setting. Lockhart’s love of the West was lifelong, and she worked hard to preserve what she believed was the authentic frontier. In 1925 she retired to an eastern Montana ranch situated on the Bighorn River near the Pryor Mountains. Taking the position that “petticoats are no bar to progress in either writing or ranching,” Lockhart developed a working homestead and eventually acquired cattle. The Carolyn Lockhart Ranch, photo courtesy of the State Historic Preservation Office. Explaining her willingness to take up the difficult life of ranching when she was already economically successful, Lockhart wrote in a press release to the Cody Enterprise: “Miss Lockhart is a lover of the old west, and made her home in Cody for many years until the dudes and the march of progress made this an altogether too citified atmosphere for her tastes. In the Dryhead country she has found just the haven which she desires. . . . [There] the drone of the motor car is unknown.” Lockhart’s final novel expressed a similar nostalgia for the primitivism of an Old West that she feared was disappearing. Published in 1933, it was aptly titled The Old West and the New. Dorothy Johnson (perhaps Montana’s most beloved female author) suggested that it was harder for women to write Westerns because “a woman’s name on a Western book scares off a number of readers. . . . [T]hey think women can’t write what they want to read.” Certainly, Caroline Lockhart enjoyed publishing success in spite of her gender. Unlike Lockhart and Johnson, Bertha Muzzy Sinclair Cowan excelled in the masculine genre of the Western in part because she published under the name B. M. Bower, allowing her audience to assume that she was a man. Born in Minnesota in 1871, Bertha Muzzy (B. M.) moved with her family to a ranch near Big Sandy in 1889. She married three times but published under Bower, her first husband’s name. Bower’s stories took place at the fictitious Flying U ranch in north-central Montana. Readers were drawn in by Bower’s convincing portrait of ranch life, which was based in part on her experiences. Her readers’ assumptions that she must be a man—because only a man could know that much about cows and cowboys—also contributed to Bower’s success. Traveling this summer? The Caroline Lockhart Ranch is on the National Register of Historic Places. 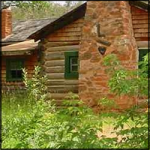 Visit it and other historic sites related to Montana women, and learn more by clicking here. Want to know more about Dorothy Johnson? Read the WHM Blog post about her by clicking here. You can also read several of her articles about growing up in Montana by visiting our Articles from Montana the Magazine of Western History page. You can also watch this video from Montana PBS. Check out other streaming video resources by clicking here! Clayton, John. The Cowboy Girl: The Life of Caroline Lockhart. Lincoln: University of Nebraska Press, 2007. Culpin, Mary Shivers. Draft of “Caroline Lockhart Ranch: Bighorn Canyon National Recreation Area.” National Park Service, Rocky Mountain Regional Office, 1981. Available online at http://www.nps.gov/history/history/online_books/bica/caroline_lockhard_ranch.pdf. Accessed February 27, 2014. Davison, Stanley. “Chip of the Flying-U: The Author Was a Lady.” Montana The Magazine of Western History 23, no. 2 (Spring 1973), 2-15. Furman, Necah Stewart. “Western Author Caroline Lockhart and Her Perspectives on Wyoming.” Montana The Magazine of Western History 36, no. 1 (Winter 1986), 50-59. Great Falls Tribune staff. “B. M. Bower,” in “125 Montana Newsmakers.” Available online at http://www.greatfallstribune.com/multimedia/125newsmakers1/bower.html. Accessed February 27, 2014. National Park Service. 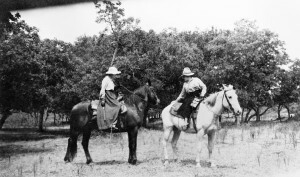 “Caroline Lockhart Ranch.” Available online at http://www.nps.gov/bica/historyculture/caroline-lockhart-ranch.htm. Accessed February 27, 2014.